I wake up to find a beam of sunshine shining down on me from a skylight in the ceiling that I hadn’t even noticed the night before. It’s 5:30 a.m.
I’m still kicking myself having discovered last night that I left my battery camera charger and one of my $50 batteries in the last hotel. I’m usually so good about NOT leaving things in hotels. I have a second charger at home but I won’t be able to charge a camera battery now and I only have one extra charged battery plus the partially charged battery that is in the camera. I’m going to have to be very selective about the pictures I take from now on. Doc and I have the breakfast buffet in the Irma’s bar. It’s a beautiful room still wearing its old west décor with Buffalo Bill’s family photos on the wall along with stuffed antelope and deer heads. As we’re eating our eggs and ham, a waitress comes by and encourages us to try the bread pudding with whiskey sauce. She seems to think it’s super fantastic. She warns us that a little bit of the sauce goes a long way. When I finish my meal I go back to the buffet to get a sampling. A waiter standing at the buffet slicing pieces of ham watches me carefully as I spoon bread pudding into two dishes. He’s staring and seems to be acting a little weird. “Is this the sauce for the bread pudding?” I ask hoping to break the tension as I reach for a spoonful of the unlabeled sauce. “A little bit goes a long way,” he warns. The sauce is brown and watery unlike the usual sauce that I would expect to to accompany a bread pudding. I drizzle a little bit in each of our cups. I don’t use much because I know it will soak into the pudding and make it soggy. I return to the table where I don’t find the bread pudding to be particularly good. It’s soft and somewhat mushy, probably in part due to the watery sauce, and I’m not sure why the waitress recommended it. After two or three bites I realize that my throat is getting hot and my sinuses are clearing. I look over at Doc who is still working on his scrambled eggs. “I don’t think they should be calling this a sauce,” I tell him. I’m pretty sure that the bread pudding “sauce” that I’m eating is pure whiskey. Last night, we said our goodbyes to our family who have a 12-hour drive back to Salt Lake City today. We also have to begin our own drive back toward the east. 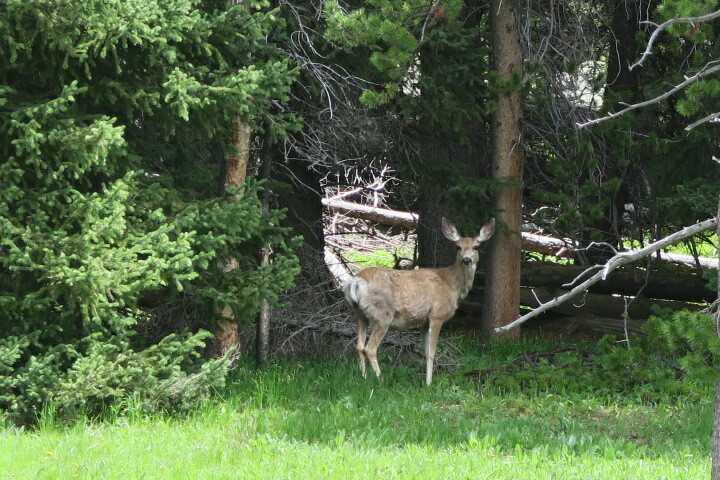 This time we are traveling Route 14 across the Bighorn Mountains. It’s the same road we traveled 23 years ago, which we found so stunningly beautiful. It turns out to be the prettiest of the three routes across the mountain range. 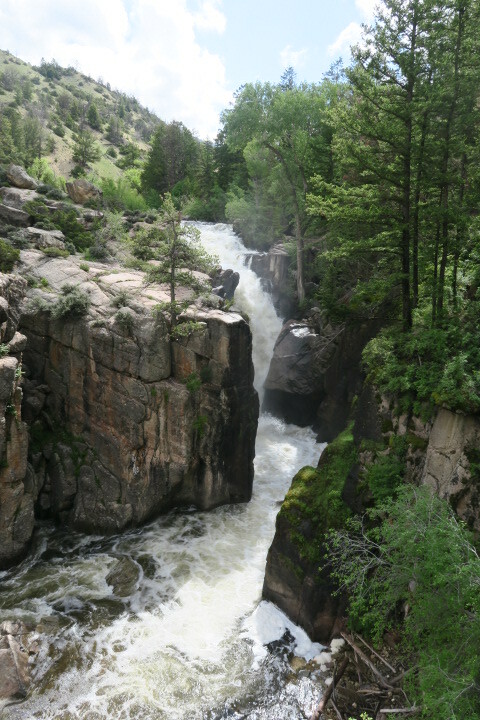 We stop along the road at Shell Falls. It’s a beautiful waterfall and a sidewalk path takes us past a display garden of labeled native plants. It’s a stop that is well worth our half hour visit. Back on the road, we reach the summit of the mountain and a huge field opens up in front of us. 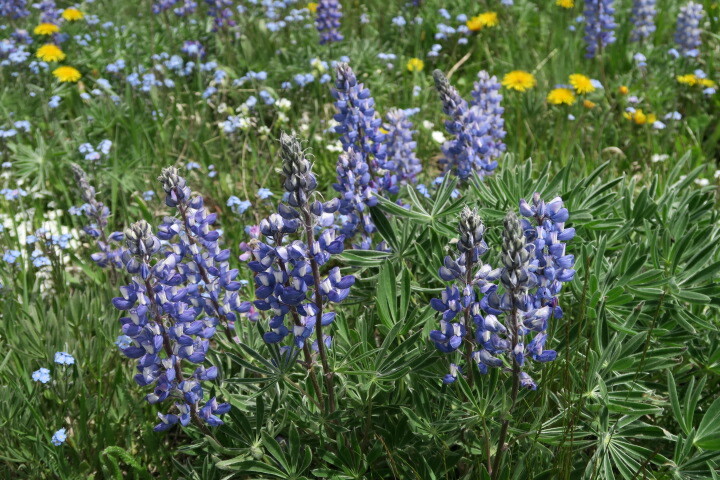 I planned this entire trip around the bloom time of the lupines hoping to see the fields filled with them that we remember from our first vacation 23 years ago. Until now, we had seen one or two here and there. 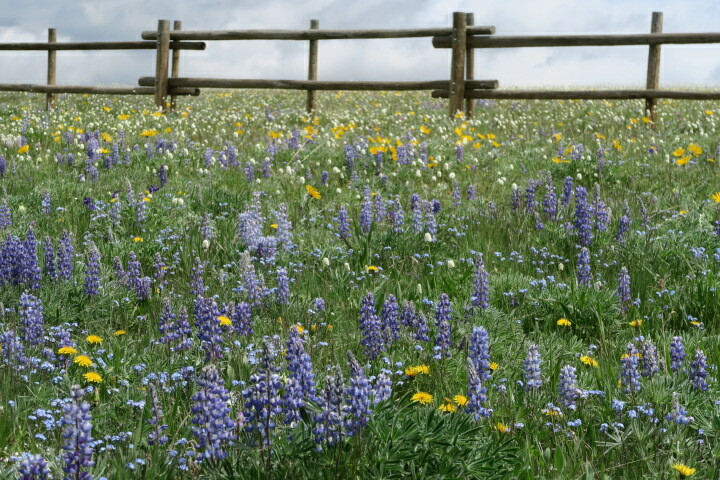 This meadow is filled with a sea of the blue flowers. Doc stops the car so that I can get out to take lots of pictures. 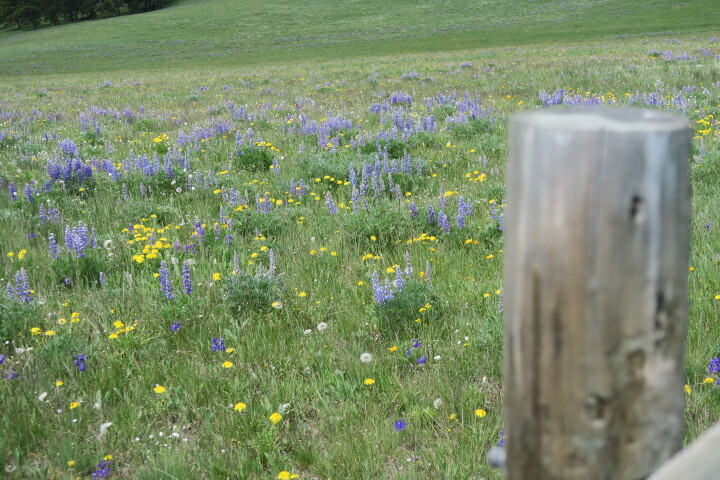 I moved across the field trying not to step on flowers but there are so many of them, that it’s difficult to avoid them. It’s a beautiful scene but it doesn’t live up to my memories and expectations. Which is why I rarely travel to the same place twice. 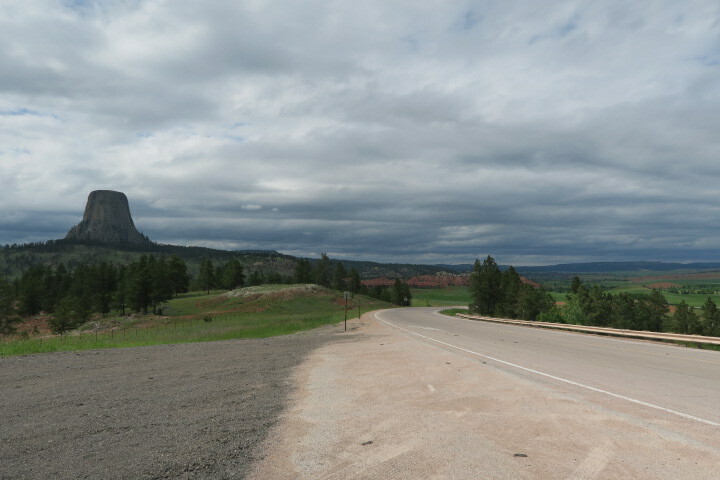 As we start down the east side of the mountains, we are driving on the edge of a cliff. Suddenly we run into thick clouds that make it nearly impossible to see the road. We know there’s a car ahead of us, but we only get an occasional glimpse of his brake lights. It’s a struggle to see the center line directly in front of us. Doc slows the car and we crawl down the mountainside, struggling to make out the next twist and hairpin turn. The clouds grow thicker and the drive has us both on the edge of our seats. We have to descend about halfway down the mountain before we drop below the cloud line and the mist finally clears. Relieved, we stop at a pull off to catch our breaths and enjoy the magnificent view of the valley below. 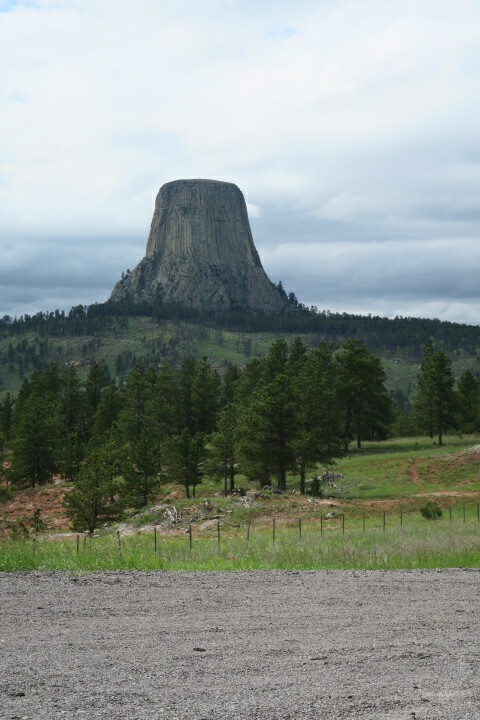 We get to Devil’s Tower at around 4 p.m. We have been here before, but I’m not sure I’ll ever tire of seeing it. 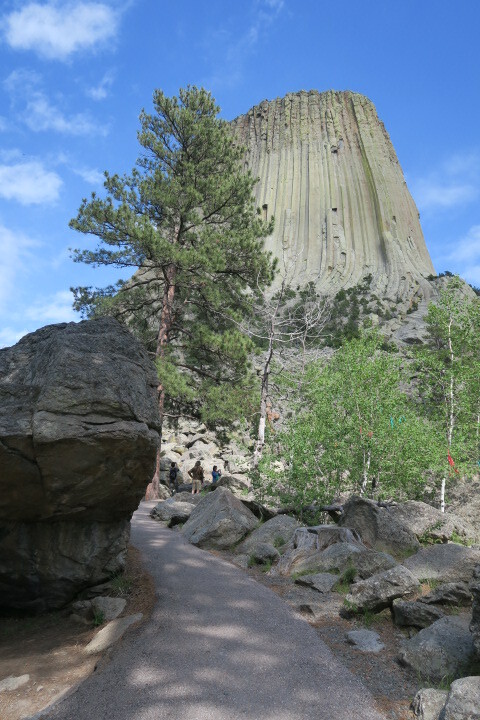 It’s an astounding geologic feature and I think it must be my favorite place in the United States. It is, at least, in my top 5. We can see the tower before we reach the park entrance. We stop several times just to look at it from various viewpoints. Several years ago, Doc bought a National Park’s senior pass for $50. It’s a lifetime pass that allows us into any National Park for free. The entrance attendant checks Doc’s ID and dumb luck finds us a parking space right in front of the visitor’s center. The tower is open 24 hours a day and we see a notice about a nighttime ranger led hike. I can just imagine how bright the stars must be out here on the midnight prairie without city lights to dillute its brilliance. Note to self: Next time, plan a nighttime visit. 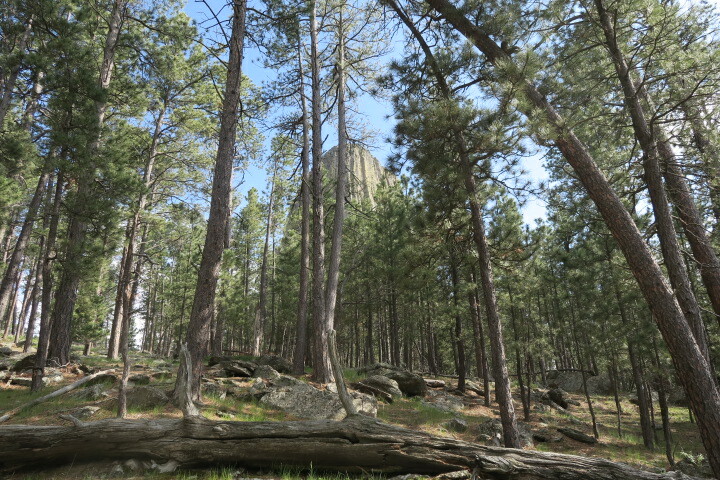 We walk the mile long trail that circles Devil’s Tower. It takes us over two hours as we take our time, stop to read the informational boards, and take in at all the great views. 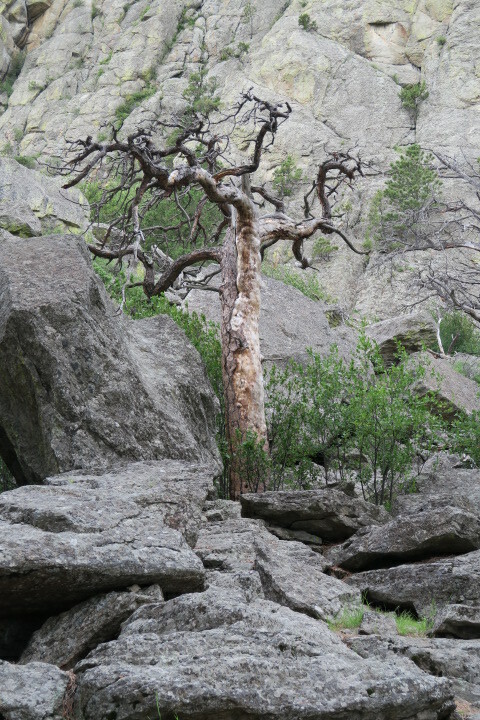 The Lakota Indians consider this to be a sacred place and we see prayer bundles tied to trees along the trail. Two men are climbing the tower today. We spot their tiny figures against the massive gray rock. Even through binoculars they are the size of bugs. I walk slowly, enjoying the incredible beauty of this place until the sinking sun reminds us that we have to be moving on.